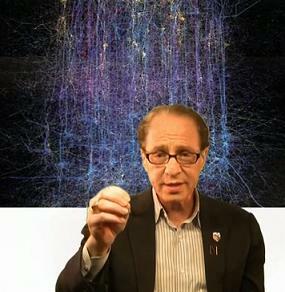 Here's Kurzweil doing his best Max Headroom impression while he discusses BCI. Offering money as a prize for scientific endeavors has a long history of success. That’s how we got a clock accurate enough to calculate longitude, and an aviator brave enough to cross the Atlantic. Perhaps the most recent spectacular example of this is the X Prize, whose encouragement helped get private enterprise into space in 2004. Well, now the X Prize Foundation is settings its sights on brain computer interfaces (BCI). Rod Furlan already gave us an amazing guest post on the recent X Prize BCI conference at MIT. He mentioned some of the great keynote speakers at the conference, and Ray Kurzweil’s 36 minute talk is available online. We thought we would post that video here so you can see for yourself what all the BCI hub-bub is about. Enjoy it after the break. Don’t have 36 minutes? As always here at the Hub, we’ve got a handy list of highlights to help you out. The video follows immediately after. 2:35 – Kurzweil briefly discusses his Law of Accelerating Returns. Those familiar with his talks should skip ahead. If you’ve never heard it, you can find a more in depth discussion of these concepts in his opening talk to Singularity University. 4:30 – We’ve gone through five paradigms in the hardware of computing so far. The sixth paradigm will be 3D layered computer chips, already in production by Intel. 8:30 – The growth of computing will lead to the capability of modeling the human brain. 11:30 – Brain simulation will help us understand the principles of the brain, and thought itself. We can then refine and amplify those principles. 13:00 – Eventually, scientists will create the neocortex outside a biological setting. So this new “human mind” will exist inside a computer context with all the enhancements to speed and memory that such existence entails. 16:47 – An interesting diagram of reverse engineering the brain. 17:15 – Analyzing the visual cortex is helping computer scientists develop better video and video recognition. 18:45 – Turns out that our optic nerves take the very complex signals from our eyes and translate them into 7 very simple “movies” that are sent on to the brain. 21:20 – Kurzweil discusses cerebellum modeling. 22:30 – The cerebral cortex is made of repeating modules. Each unit is responsible for recognizing patterns. Humans brains have long outperformed computers in pattern recognition. So these units are part of what really make us human and what we need to understand when modeling the brain. 25:38 – We’ve already slowly been replacing parts of the brain. Cochlear implants and retinal implants are gaining ground. Implants in the brain may help with diseases like Parkinson’s. Ultimately, we’ll have to face the implications of people who have had to replace their brains the same way others had to replace a kidney. 29:00 – Kurzweil begins to conclude his talk by discussing how one might form a X Prize for brain computer interfaces. What form should such a prize take? Focusing on just one area would be detrimental. 32:40 – Locked-in syndrome sets the bar for BCI in some ways. 33:35 – Video games may influence the development of non-invasive BCI. The X Prize Foundation and MIT have also taken some powerful steps to influence the upcoming generation of engineers themselves. The X Prize Lab is a semester long session at MIT where students are exposed to the major areas of research which may be ripe for breakthrough innovation. These include education, exploration, energy, environment, global entrepreneurship, and life sciences. It was the X Prize Lab, and Singularity University, who sponsored the BCI conference. If I told you out of context that prize money was going to lead to your body living forever (M Prize) or being able to download yourself onto a computer (BCI X Prize), you probably would think I was nuts. However, when you look at the work already accomplished by the prize system, and the X Prize in particular, it’s hard not to think that these contests will generate meaningful acceleration in science wherever they are applied. I look forward to seeing how the BCI X Prize will take shape. What will it ask for? What will the major hurdles be? The form it takes could influence how brain researchers shape their experiments for years to come. Who knows, maybe somebody will even win it.